Well, I'm not sure that everyone has sort of picked up on the idea of what the Waiver Draft is all about, since looking at the numbers, the bottom teams didn't get all that much better and the top team is now absolutely running away with everything. It's almost embarrassing, really. The Bruins are continuing to roll right along in the Atlantic Division and that's thanks to their top line, which was doing what they do again this week and that's put points up on the board. Brad Marchand was the leader of the pack this week, finishing with 2 goals and 8 points, alone at the top of the scoring race for the week, just a point better than a few others who finished with 7 points, including linemate Patrice Bergeron. Marchand and company played in four games in Week Nineteen and the "little ball of hate" had points in all four games, actually posting a pair of points in each game. A pair of assists against the Islanders on Tuesday, a pair of assists against the Rangers on Wednesday, a goal and an assist against the Kings on Saturday and then another goal and an assist against the Avalanche on Sunday. There was certainly a level of consistency in there. The pest has now brought his overall totals up to 21 goals and 65 points in 55 games this season, which is now good enough for 14th in the overall hockey pool scoring ranks, well within the 1st round of selections, if we were to do the draft again today. There's no question that Marchand has been one of Stuart's best picks this season, having taken him with his 2nd round pick, 37th overall, he's getting quite a bit of value out of this top pick in a season where goalies haven't been nearly as valuable as years previous. So, not only has Stuart's team taken the Player of the Week nod, it ran away with the Mover & Shaker acknowledgement as well, which really looks bad on the Waiver Draft. Everyone was supposed to pick up players to make their team better to catch the money teams, but that just didn't happen. Stuart's team finished with a new season-high for points in a week with 47 and his team now has a 29-point lead in the standings. Not only did he have the Player of the Week, Stuart's team also had one of the players vying for the prize on top of that in Dylan Strome of the Blackhawks, who finished with 7 points, really taking off since his move to Chicago and now leads all players taken in the Week Nine Waiver Draft in scoring since their activation with 27 points. An absolutely clever pick. And then, there was another Waiver Draft pick, this time a Week Eighteen pick, Anders Nilsson of the Senators had 6 points, really making everyone look bad, since everyone had a shot at him before Stuart made the pick. Patrick Kane of the Blackhawks also had 5 points in the week, followed by Brayden Point of the Lightning and Thomas Greiss of the Islanders, each posting 4 points to round out his most notable players. It's an embarrassment of riches on Stuart's team and now his team has almost put itself out of reach for anyone else to really catch it. The most remarkable statistic on his team, however, is that it isn't a plus team when it comes to the plus/minus stat, as a collective. His team is a combined -9 this season and was a -3 this past week, which suggests that his team does get most of its points on the power play or at the very least, doesn't play a lot of defense. It wasn't a very good week for Scott's team, which just couldn't get any traction at all, even with a couple of new players on his roster, nothing was really sticking to the scoresheet for him. His top pick, Pittsburgh's Matt Murray, got hurt in the week and only played one game, which he didn't win and the rest of his team couldn't do any better than 2 points for any one player and it all didn't add up to very much. 14 points, to be exact, and his team fell even further behind. Five players on his team finished with 2 points to lead the way for his team, while three skaters and both of his goalies failed to register a point and now his team is 25 points behind 24th place, getting to the point where his team may not be able to get out of last place before the end of the year. It isn't like Scott's team didn't have their chances this week either. They were able to play 40 skater games, which was tied for 12th, only six games behind the leader, and his goalies combined for 180 minutes or three starts. They just couldn't pull it off. It's just been an unfortunate combination of players and bad luck this year for Scott and not even the Waiver Drafts have been able to save his team. So, Stuart's lead is now 29 points and I think we can leave that right there. Stacey M.'s team finished 2nd in the weekly scoring, which means that no one was making up any ground on her team either this week and the gap between 2nd and 3rd place, Grant's team, is now 15 points. That's not quite as daunting, but it's getting there. After the money teams, it does stay relatively interesting. Kristy & Don now crept to within 1 point of Grant's team, while Wes' team also made up ground on Wes, now 10 points behind. Then there is a bit of a drop off to 6th place, where Steve lost ground and is now 17 points behind Wes' team. Minus a really big Mover & Shaker week, the top five look pretty solid for the rest of the way. Well, tanking the overall season and loading up on the rookie pool seems to be a money back guarantee for Derek B. 's team, which set a new season-high for points in a week from the freshmen, posting 13 points and taking the lead in the mini-game. 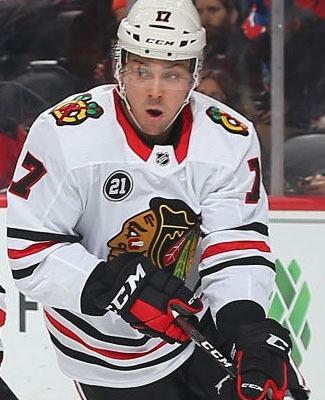 Derek's team now has 73 points from rookies, 4 points better than Clayton's team, thanks in large part to Chicago's Dominik Kahun, who helped lead his team with 5 points in the week. Toronto's Andreas Johnsson was the top rookie in the week, finishing with 6 points and adding a blip to the radar from Wilton's team in Week Nineteen. Wilton's team is now 7th in the mini-game, with 28 points. There was a huge run on shootout goals in Week Nineteen, the pool combined for 9 goals in the skills competition, as there were a handful of games that went beyond overtime, not to mention the amount of games that finished up in overtime. Mike's team went tops in the mini-game after his team posted a couple of goals in the week, his team sits alone with 8 goals, while John P. joined Jeremy's team at 7 goals in the week, rounding out the top three teams. Maybe this mini-game has some heat left in it yet. The game-winning goals mini-game still has some fire left in it, as the pool picked up a combined 39 markers out of 55 games, tied for the season-high in weekly tallies. Clayton's team was tops in the week, picking up 4 goals, but only made up a single goal on the overall lead, which also belongs to Stuart. Stuart's team sits at 38 game-winners, followed by Clayton's team at 29. There's still potential for this race to get interesting, then again, who really knows? We haven't done a goon team of the week in a while, but that's mostly because we had some very lacklustre weeks on the schedule, so there wasn't a whole lot to report. Grant's team, however, posted a 42-minute week in the penalty box, tied for 3rd-highest this season for a weekly total and his team has now climbed up to 4th in the standings among the goon teams. Stuart's team still leads the PIM pool as well, which doesn't pay, but his lead has been slowly shrinking through the last segment and a bit now, as his team concentrates on scoring, scoring and scoring some more. His team's lead here is now 18 minutes over Scott's team and 25 minutes over Ryan's team. There's room to shuffle some more teams in here somewhere before the end of the year. Thanks to the Waiver Draft, we got what we wanted! More participation and more points! We set new season highs in skater games played (995), goalie minutes played (5,669) and points scored (724) in the 55 NHL games this week, which was all really, really great! I don't know how long it's all going to last, but it's trending in the right direction. Only one team had a note from Sunday's action and that was the Tampa Bay Lightning, who had Ondrej Palat come out of the lineup, due to an upper-body injury, he's listed as day-to-day with the injury and there wasn't much more made of the situation by the team. Defenseman Anton Stralman returned to the lineup after coming out as a healthy scratch on Saturday night, as the Lightning are now in full rotation mode on the blueline, keeping everyone fresh on the back end, which is really working out for them. The loss of Palat was a skater game missed for Stacey M., who still finished 2nd in the weekly scoring this week and wasn't going to catch Stuart, so it wasn't a huge loss there. The return of Stralman was good news for Troy's team, but maybe too little, too late there.